Have these 10 essentials by your side when it’s feeding time to make life a little easier. In case you missed the big announcement yesterday we are expecting our third baby in a few months! As we are getting ready for his (or her) arrival I started thinking about the things we already have and the things we still need. 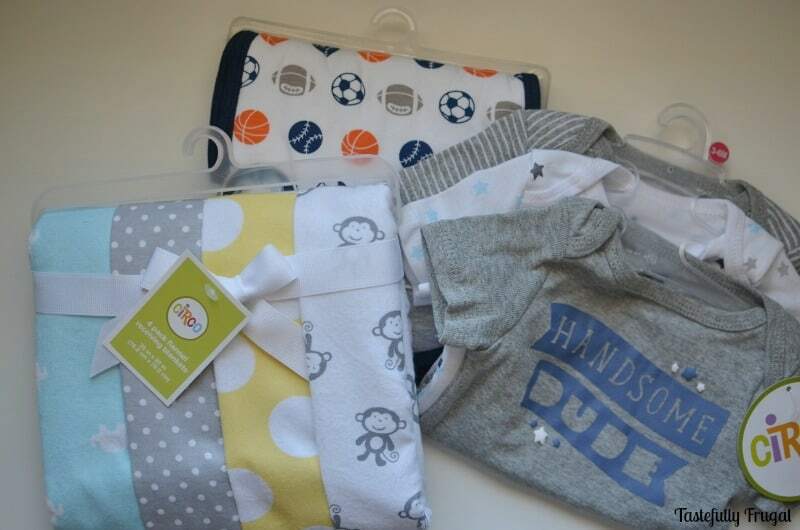 We’ve got the clothing, bedding and toys taken care of and we even have a few small diapers left over from our last two babies (our boys quickly grew into size 2 diapers before we could use all the newborn and size 1). Then I remembered how stressful feeding time could be. You know when it’s 2 in the morning and your baby is eating and then you hear, and feel, that lovely mush come out of their diaper. 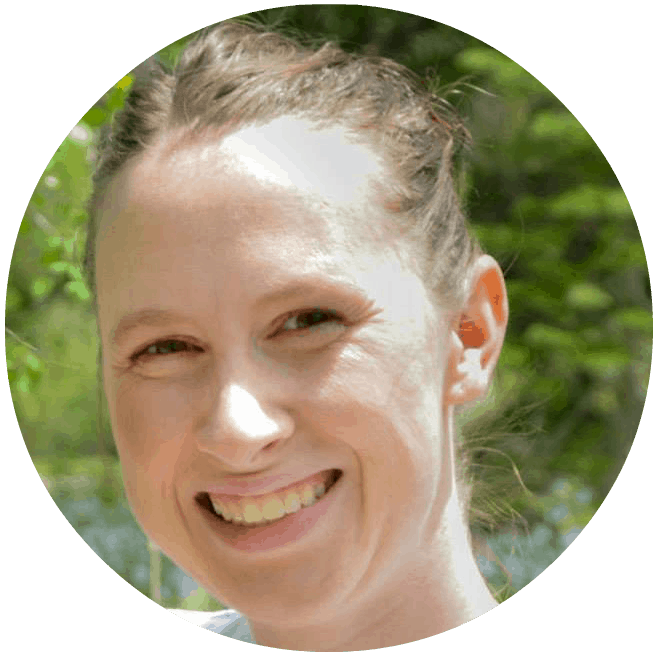 This time around I wanted to make sure I had everything I needed for during (and after) feedings readily available. So what did I do? I headed to my favorite store of course, Target! When we had our first baby I had debated between doing a registry at the baby store or Target or both but after seeing all the cute baby stuff Target has, and realizing the pricing on everything else was better than the baby store, we went with Target. I started by picking up a few new Circo onesies, burp cloths and blankets for the baby because how can you pass up cute baby clothes right?! Then I headed over to get the necessities. Whether you’re breast or bottle feeding, and I’ve done both, it’s always good to have at least one bottle where you can find it at all times. 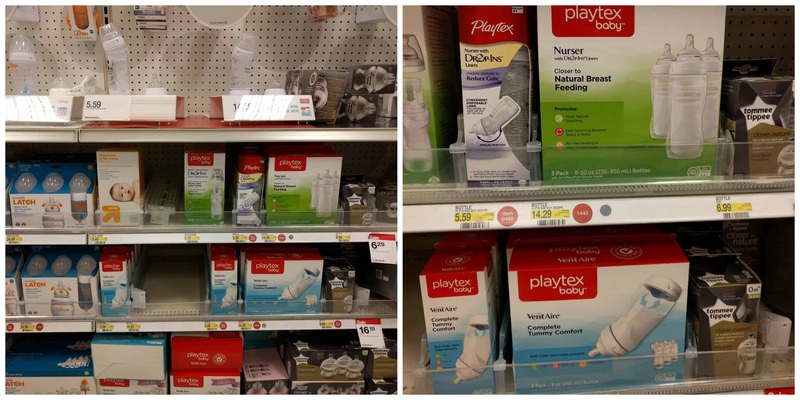 We tried several bottles with my first and found that the Playtex Vent-Aire were the easiest for him to transition from breastfeeding to bottle feeding. We later learned that the design of the bottle, with the angle, helps prevent ear infections too and helped keep his tummy happy. 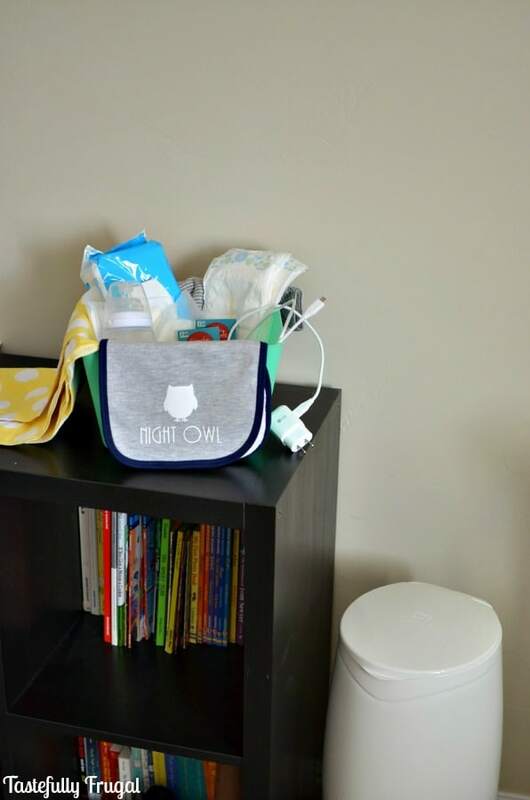 Bottles are also a great thing to have if your baby gets constipated; the prune juice they make for babies saved our butts (and his) a few times! **Of course I’m not a pediatrician, always consult your doctor with health concerns. 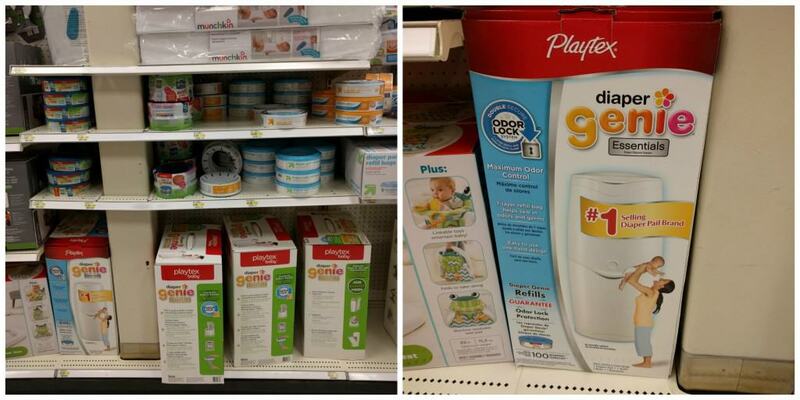 My second must was the Diaper Genie. Ours somehow got lost in our last move and I knew we needed to replace it when we were having another baby. The simple fact is babies poop…a lot. And unless you have somewhere sealed to place all those dirty diapers your home can quickly start to smell like a bathroom…All. The. Time. I was excited to see the new Diaper Genie Complete is even easier to use than our old one with a foot pedal to open so I can throw away a dirty diaper at the same time I’m feeding my baby. New moms don’t worry you will learn to be a multi-tasker in no time! 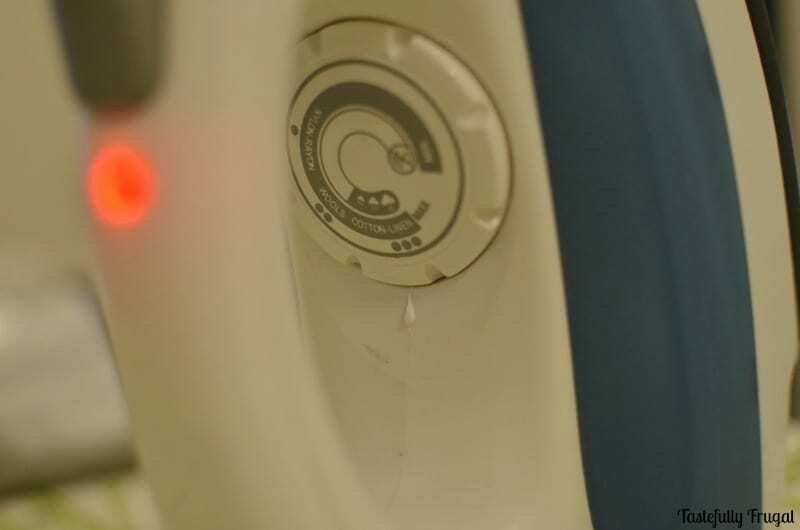 The new Air-Tite® CLAMP and carbon filter also keep the odor sealed in the genie and it can hold up to 270 diapers. Believe me, the less you have to take diapers to the trash can the better! To go along with the Diaper Genie I also picked up a few extra diapers and some wipes, nursing pads (because we’ve all had those days where we forgot to put nursing pads in and the second you hear your baby cry, or just because, you leak through your bra and ruin your favorite shirt), and a few snacks. As moms we often forget to feed ourselves, we’re so busy taking care of everyone and everything else. You don’t realize you’re hungry until you sit down for 2 seconds and your stomach rumbles loud enough to shake your baby! 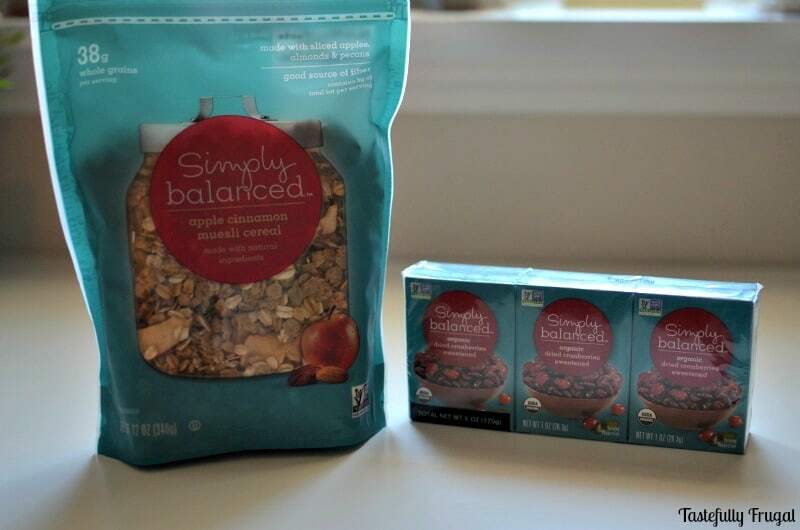 I love having dried fruit as a snack and granola. They are both filling, easy to snack on and help keep me regular, which is something else you don’t think about right after you have a baby. I picked up a cute box from Bullseye’s Playground and headed home to put my feeding kit together. The last thing I included was an extra phone charger. Whether you’re a new mom whose baby sleeps a lot during the day and you’re main form of communication to the outside world is your phone (hey it happens, I know) or you’re older kids like to “borrow” your phone to play games, use that 10 or 15 minutes of feeding time to make sure your phone is charged. When I got home I realized how plain the burp cloths were and wanted to add a little something to them. 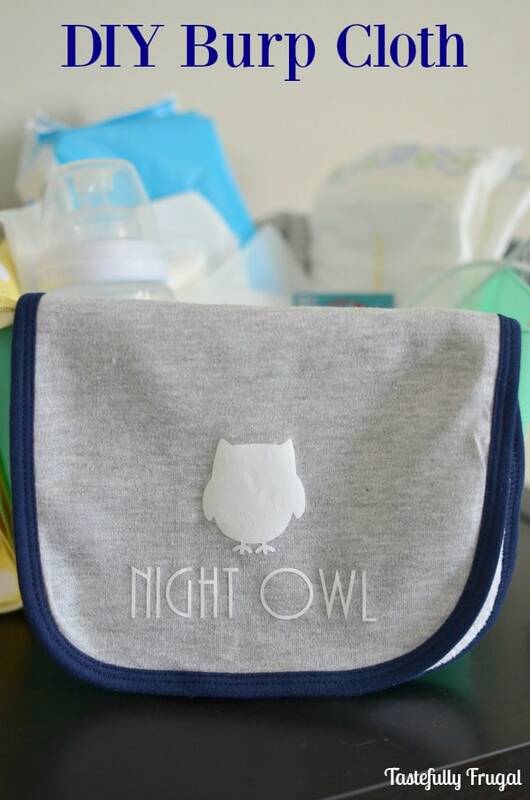 Personalizing burp cloths, onesies and blankets is pretty easy and it’s always fun to have something unique and cute to match your cute baby! Design your saying or picture in your design studio and measure it to make sure it will fit on your burp cloth (Mine was about 3.5″ x 4″). 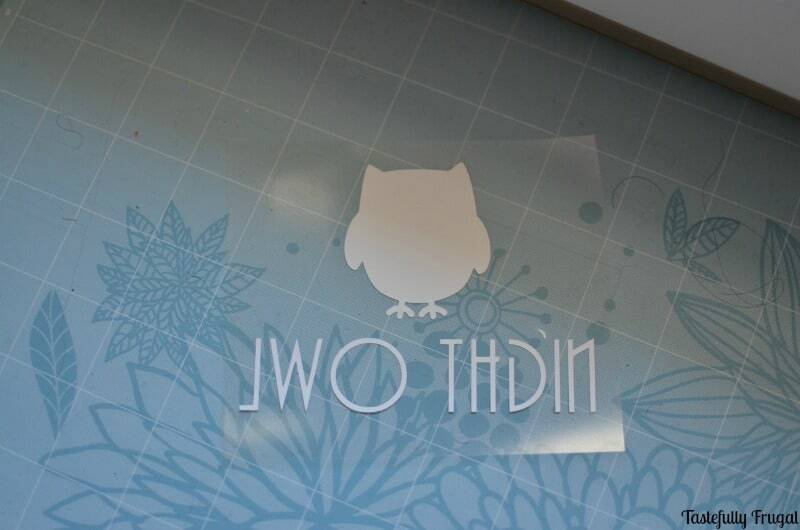 Mirror your image in your design studio so that it looks backwards (This is important because if you don’t when you put it on your burp cloth it will read backwards). 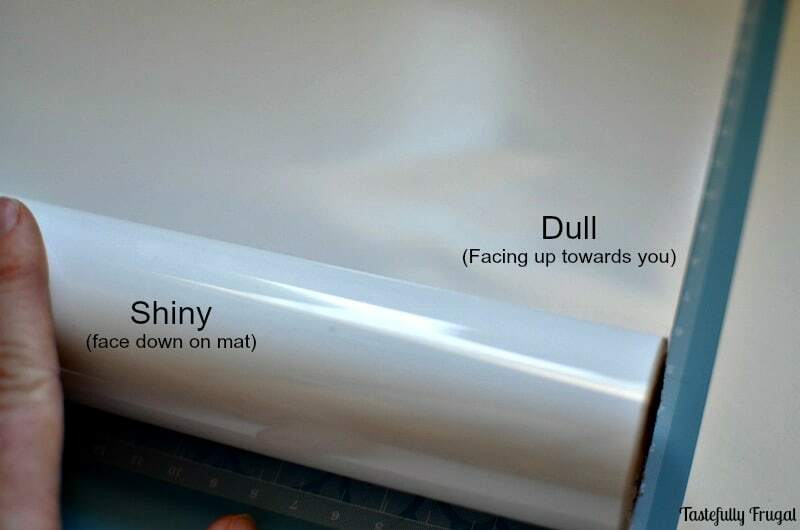 Load the heat transfer vinyl into your cutter (You’ll want to have the shiny side face down on your cutting mat). Cut your image out of the heat transfer vinyl and remove the extra vinyl. Set your iron to the cotton setting and let iron warm for a minute or two. Heat up the area on your burp cloth where you want your design to be for 15 seconds. Place your design on your burp cloth and, with medium pressure, hold iron over it for 30 seconds (you may want to put a dishtowel between your iron and the design to make sure the film doesn’t stick to your iron. I haven’t had an issue in the past but I know others have). 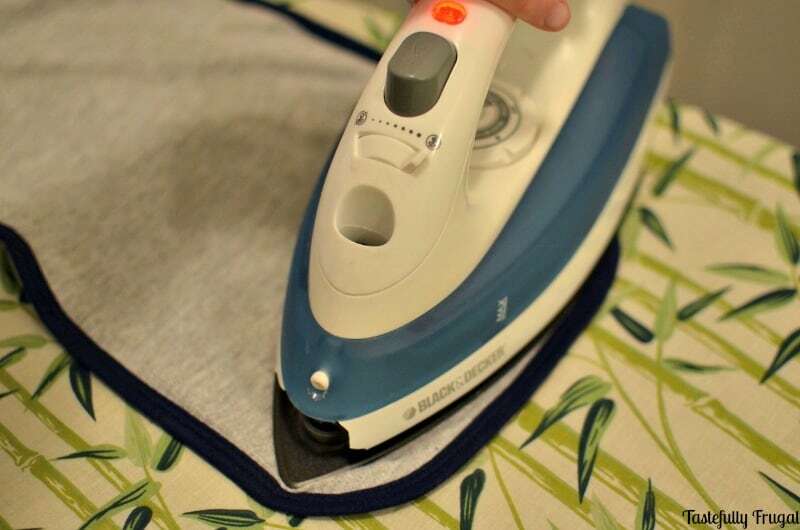 Turn burp cloth over and iron again for 30 seconds. Wait 2 minutes to remove film. 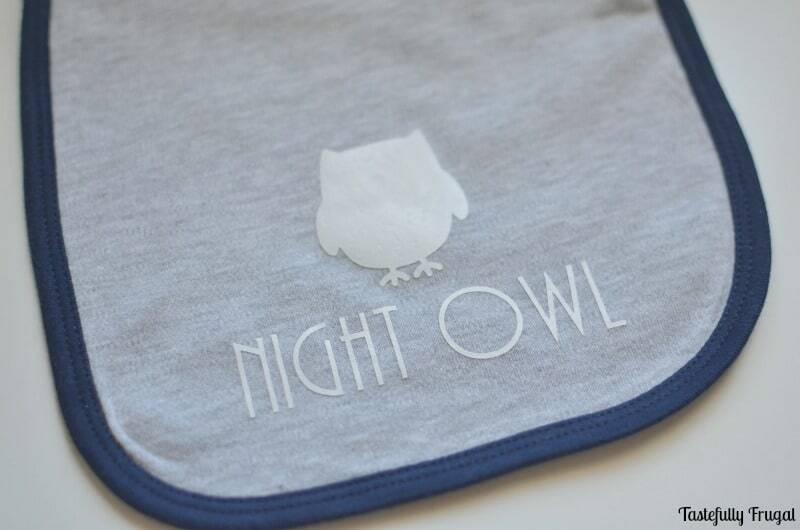 Now you have a cute little burp cloth for your little night owl to spit up all over. Are you expecting a baby soon? 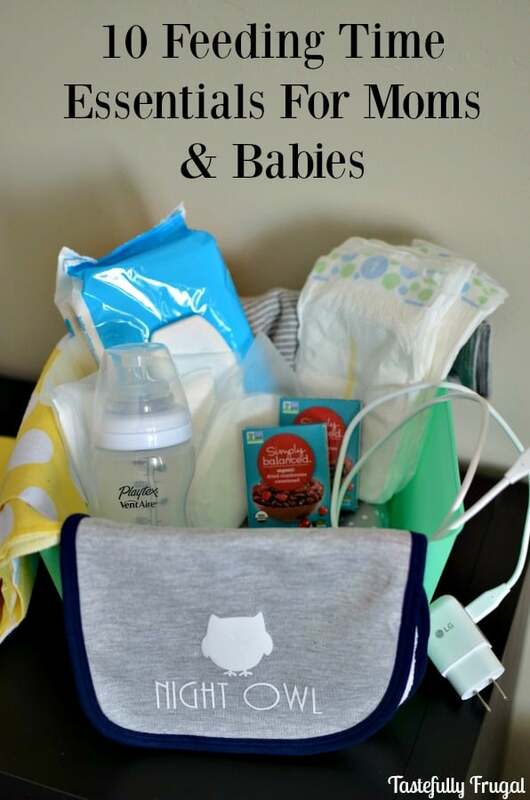 For more tips on how to have great beginnings check out Playtex Baby on Facebook and YouTube or visit your local Target to pick up your own Playtex Bottles or Diaper Genie. This is such a great list! And I am amazed with how well that burp cloth came out! Adorable! 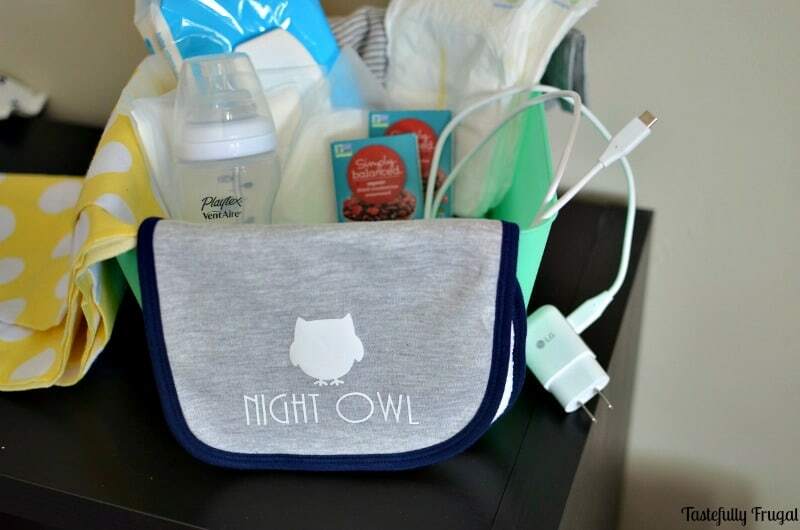 I’m going to grab a few next time I’m at Target and make baby gifts for my expecting friends! Thanks so much Cristi! You are way more talented and have a lot more patience than I do if you can cut vinyl by hand!! Congrats on your pregnancy, Sydney! So happy for you! These are all great suggestions for moms and I especially love your cute DIY bib.